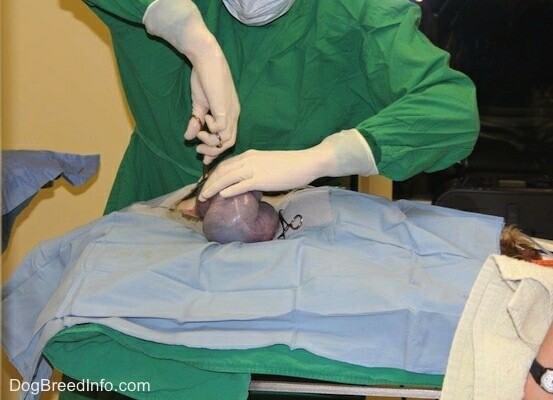 This pictures shows a female dog having a cesarean section. The vet cut the dog open and pulled out the uterine horn full of pups and then cut the pups out of the horn. There was a dead pup in this litter inhibiting a natural birth. There were also 6 healthy puppies. 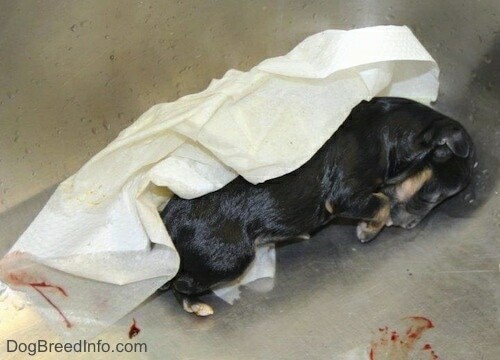 A cesarean section was needed because of one dead puppy in an otherwise healthy litter. The mother dog (dam) had been in labor for a long time. It became apparent that something was wrong. After the vets spent about 4 hours of water breaking and internal examinations an experienced mid woof was asked to do an internal. She could feel the puppy. When applying pressure to the pup she could press and make an indent, but like play-doh, it did not pop back out as it would in a live puppy. She was pretty sure the problem was a dead pup inhibiting normal delivery and she was correct. 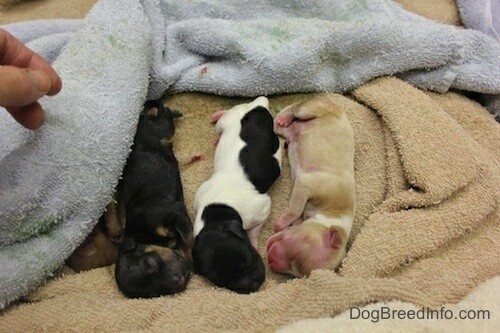 A c-section was needed to save the other healthy puppies. The pup had been cleaned up for the photo. She was in a sack full of meconium and was not a pretty site. This photo shows the head of the dead pup bent down. The dead puppy was very very stiff. On a normal whelp the nose would come out first, or feet for a breech birth. Usually when a dam pushes out a puppy the pup is long, skinny and somewhat flexable. This puppy had its head bend down and it was stiff, making it 2 to 3 times thicker as a live puppy as the head, neck, front paws and the chest were stiffened together. This puppy was not flexing like the others. It was like pushing out a brick vs. pushing out a water balloon. The circumference of the head coming out bent down like that is MUCH larger around than a head coming out nose first. 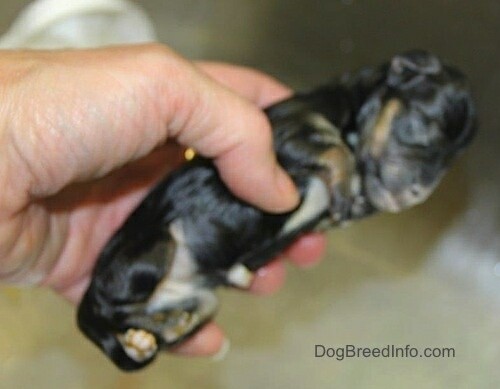 A stiff puppy is very hard for the dam to push out, where as a wiggling soft, flexible puppy helps with the delivery.